Holidays in Forte Village take you to a fantastic village style resort filled with sports academies, excellent restaurants, Kids’ Clubs, spas and more. Set on a soft white sandy beach, voted as one of the most beautiful in the world by Conde Nast, it’s in the perfect setting too. Couples can enjoy relaxing massages, adults only swimming pools, a wide selection of bars and candlelit dining on the beach. Families are well catered for as well. Active children can choose from basketball, football and tennis academies, with professional trainers at the top of their game leading classes for guests as young as three and up to the age of 16. There are also Kids’ Clubs where your little ones can make friends and try lots of new activities throughout the day. Leisureland is home to a bowling alley, go-karting track and lots more, while all of the restaurants cater to younger guests. There’s even a dedicated children’s restaurant with lots of delicious dishes on offer and a train to take your little ones back to Leisureland after mealtimes. 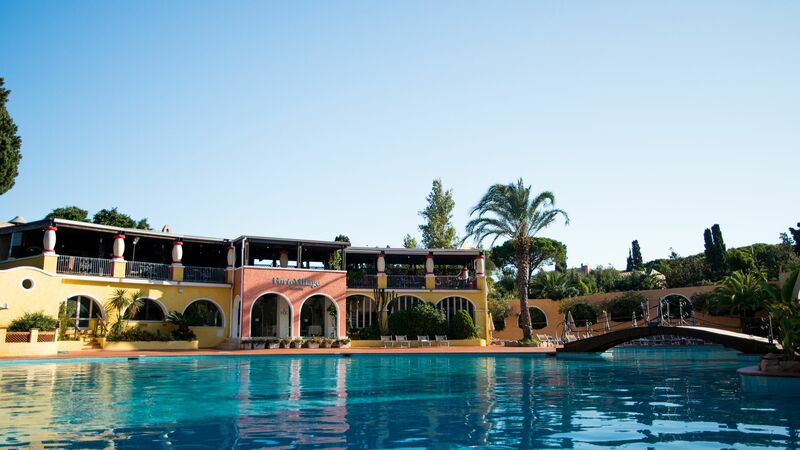 Luxury holidays in Forte Village take you to a 55 acre resort on Italy’s beautiful Sardinian coastline. It’s set on an idyllic beach and offers beautiful trails, gardens and buildings. Guests can relax in the main Piazza, or square, and enjoy fine wines, cocktails and refreshments to the live music, dancing and entertainment shows. When it comes to shopping there are boutiques boasting top notch designer labels including Gucci and Dolce & Gabbana. And for the ultimate indulgence, visit the spa for head to toe pampering at the hands of experts. Choose Sovereign for your luxury holidays in Forte Village and we’ll help you find the perfect accommodation for your stay in this fantastic resort. Stay at Le Palme for secluded bungalows with terraces overlooking the beautiful tropical gardens. Pineta has spacious rooms with excellent family options, while Hotel Castello is perfect for couples. And if you want to combine bungalows with family accommodation Hotel Bouganville is the perfect option. Transfer time from Cagliari airport to Forte Village is approximately 45 minutes.